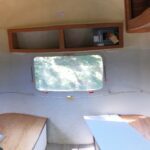 You will read on a lot of Airstream forums that diehards tell you to "Keep everything original in your Airstream". Me, I'm not that big into original oak cupboards. I didn't like them in the eighties and I don't like them now. We are painting everything white. Don't judge me. So first all of those cupboards had to come off of the hinges and were laid on makeshift tables in the basement. TSPed[trisodium phosphate], sanded and primed and painted. Then the trailer itself - all of the curtains and blinds had to come down. A piece of advice: make a drawing of the trailer and mark where everything goes. Way easier to put back. I did that with the mini-blinds. With the curtains, I marked where they came from as I am making new panels but need to know what size goes where. The mini-blinds are going to get cleaned. I had to tape EVERYTHING - the windows, the curtain tracks, the lights, the floor, the ceiling fixtures, the cover plates, the speakers - well, everything. I read that you should first use Benjamin Moore Stix, a super, high quality, premium latex primer with unparalleled adhesion qualities. This stuff is amazing. Then the latex paint goes over that. We did first clean and TSP[trisodium phosphate] everything and lightly sanded some of the surfaces. Fortunately, the air conditioning works and we're not breathing in the fumes.